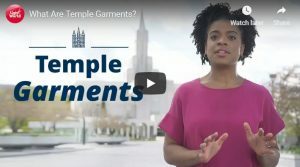 The new video “What Are Temple Garments?” explains the temple garment—the underwear worn by some members of The Church of Jesus Christ of Latter-day Saints. Much like the nun’s habit, or the Jewish prayer shawl, this clothing is meant to help Latter-day Saints remember God. You can learn more about the temple garments in Gospel Topics.